Pears are an underrated fruit; they’re such a delicious and versatile fruit. They’re one of my husband’s favorite fruits. I love finding new ways to incorporate them into my baking and cooking, and Honey Pear Jam is a perfect way to do that! 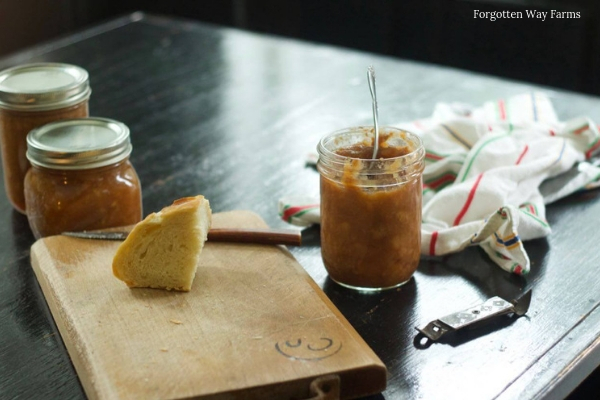 I used some beautiful, foraged winter pears for this recipe but I also love a good apricot or peach jam. Use whatever fruit you have, and experiment! Fruit jam is very forgiving. How do you make a quick jam? Well, this is a pretty quick & simple recipe! And I even have a video tutorial for you if you’re more of a visual learner. 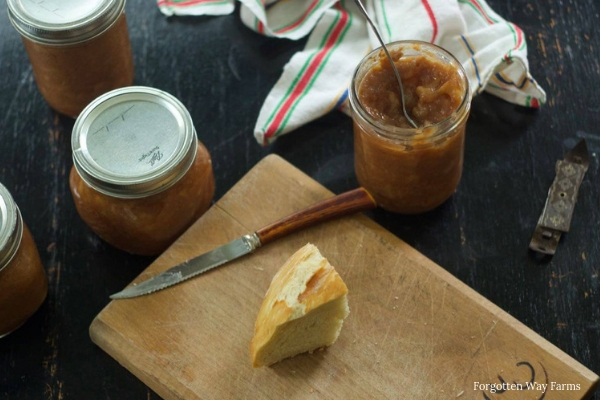 Can you make jam without pectin? Yes, I use gelatin! What can I substitute for pectin? Gelatin makes a wonderful substitute. What sugar do you use to make jam? I love using honey, but a fine, organic cane sugar works great too. There’s something about pear jam that gives me the cozy feels; maybe it’s the cinnamon and spice flavors that remind me so strongly of autumn days and adventures foraging and picking fruit. Popping a jar of jam is an immensely satisfying thing to do, it’s a jar of memories encapsulated in jelly. I suppose that’s one of the things I love about making my food, the connection that you receive with being creative and the act of making, and thinking about what you’re putting in your food. I believe that creativity is extremely important and that creativity takes many forms. For some; it’s painting, creating music, writing, sewing, designing, and decorating. 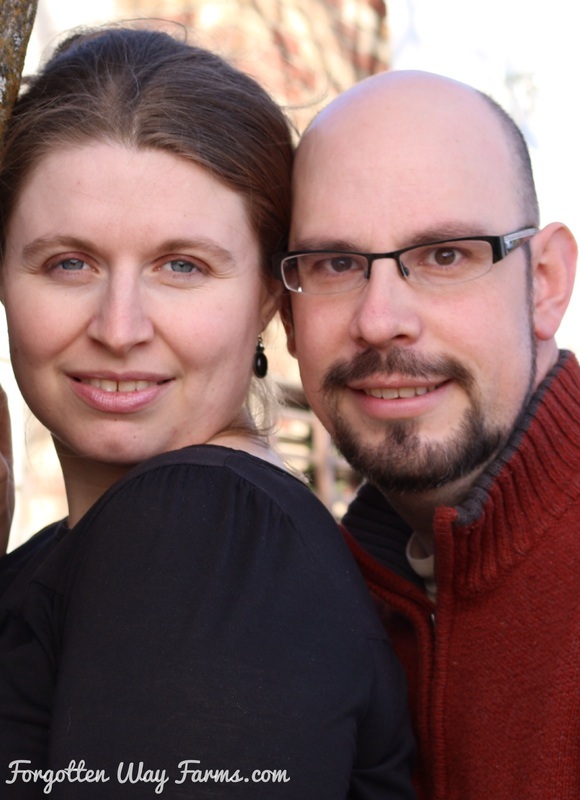 For me, it’s creating beautiful, delicious and homemade food for my family. It’s important to me! And I love it. 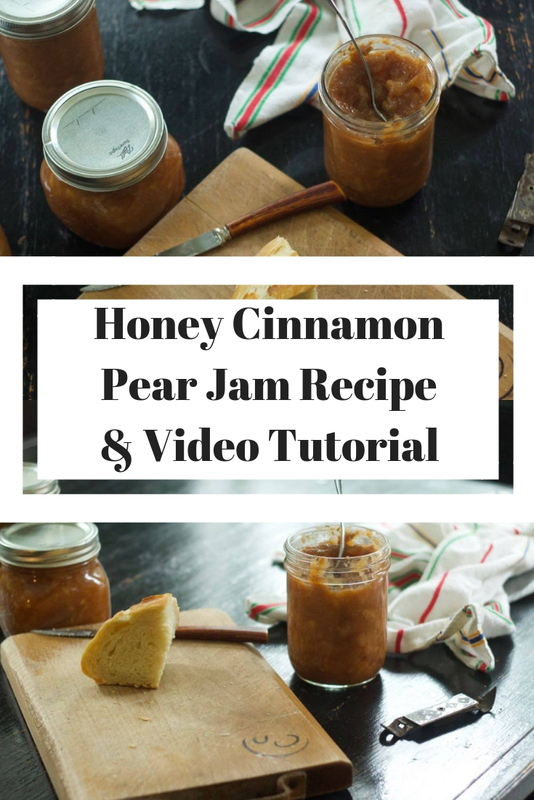 In the video below, I’ll walk you through making Homemade Honey Cinnamon Pear Jam step by step, and you can also print out the recipe and instructions below. 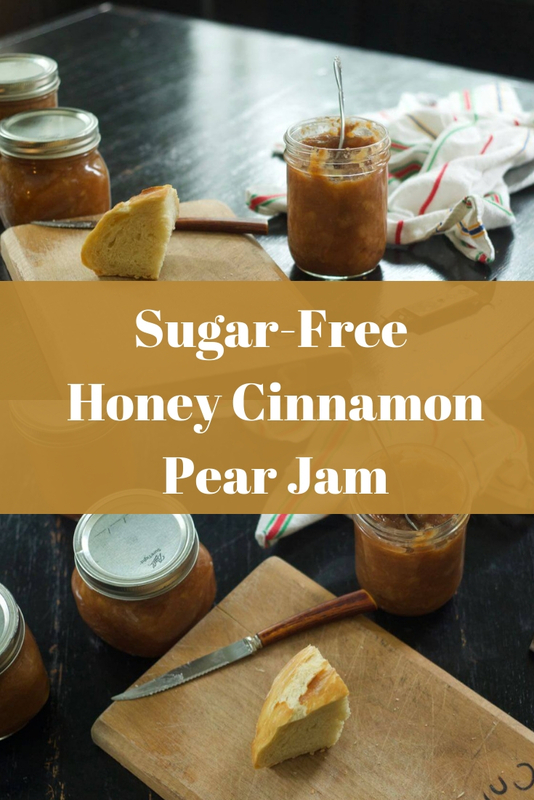 All you need for this simple Honey Cinnamon Pear Jam recipe is fruit, gelatin, cinnamon, and honey. This recipe is a simple base that is adaptable for any fruit. In a large pot measure your chopped fruit. Just remember that to every quart of fruit you’ll need a tablespoon of gelatin. Now, cook over medium-high heat. It should become a puree, similar to apple sauce. Once it’s cooked down, spoon about a cup and a half of the juice/puree into a bowl and refrigerate until cold (the pot of fruit can still be simmering while it chills). Once the juice has cooled, add the gelatin and whisk until dissolved. Add the juice/gelatin mixture to the hot fruit puree and whisk, letting simmer for another minute. Then, whisk in cinnamon (1 teaspoon to every quart of fruit). Now for the sweetener, I used honey, and just a smidgen of it as the pears are naturally very sweet. And that’s it! If you want to can your jam just follow your canner’s instructions. Tell me, are you a visual learner? I know I am! I love the resources and tutorials that YouTube provides; it’s quite handy for learning new skills. Have you ever tried making a gelatin thickened jam before? 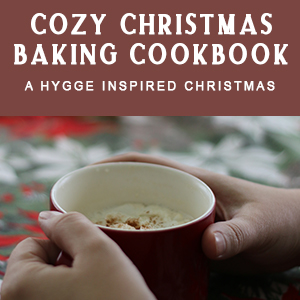 « Christmas Hygge Baking Book|Giveaway!